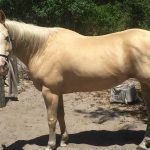 Very sweet Quarter Horse Palomino that has lived the past 12 years with her one Owner. Hello RK Stables supporters and family. We rescued a beautiful little girl two days ago. Her name is Champagne i call her Bubbles lol. So here is her story. 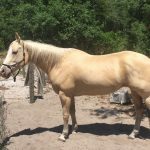 She is a very sweet Quarter Horse Palomino that has lived the past 12 years with her one owner. The owner has had some bad luck in the past year. 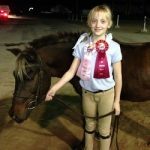 Her home burned down and many other personal things have contributed to RK Stables taking this horse into our facility. With a heavy heart she realized the love of her life was not a responsibility she could carry anymore. 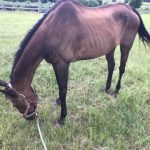 I will say this the horse had a lot of hay and she has not missed a meal. 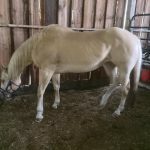 She is a fat horse lol. 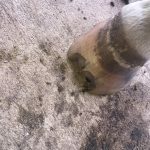 Unfortunately there is a lot more that goes into a horse for it to be healthy and safe. 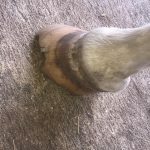 Bubbles feet have been neglected for a long time, also as I inspected her for intake I see her teeth are in desperate need of being floated. To the point i am shocked she has not already lost weight from this alone. Her underside near her utters was full of ticks and tick bites that where infected. This is where you can come in and save the day ? 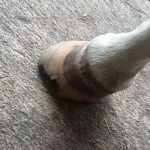 It will cost a little over $80 to care for her feet for the next 6 weeks this includes hoof supplements and $180 to float her teeth $200 a month to feed and hay her. Medication for her skin will run about $80. I will train train her to be a safe riding companion. $50 for Department of Agriculture required disease testing. 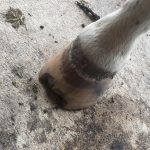 So I am asking if anyone would like to sponsor or help with any donations. 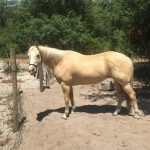 We need to raise $590 for this gorgeous and amazing horse. 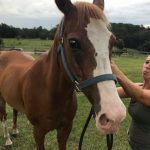 We are a 501(c)3 non profit horse rescue. Your generosity and support is always a blessing to these amazing creatures. 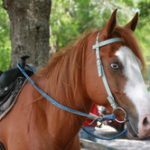 Regardless to what the government says horses are not live stock they are Emotional, Sensitive, Thinking, creatures that do feel and can express effectiom and love. Very much like a dog. Thanks everyone together we can make a difference.